Democrat Chris Holden currently represents Assembly District 41 and will not be termed out until 2024. Holden is expected to easily win re-election in 2016. Assemblymember Chris Holden begins his second term in the Assembly with a prestigious appointment as Assembly Majority Floor Leader. He brings to the legislature a lifetime of experience in public service and business garnered during his many years on the Pasadena City Council and the Burbank-Glendale-Pasadena Airport Authority. 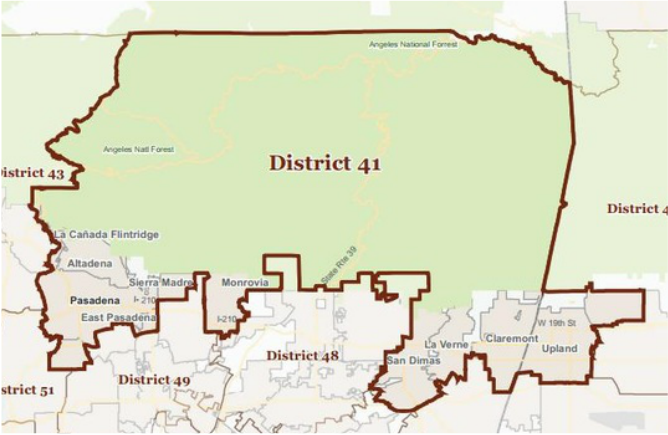 Holden was first elected to the California State Assembly in 2012, and was overwhelmingly re-elected in 2014 from a district that stretches from Pasadena in the West to Upland in the East and includes the communities of Altadena, Claremont, La Verne, Monrovia, Mt. Baldy, Rancho Cucamonga, San Dimas, San Antonio Heights, Sierra Madre, and South Pasadena. In his first term in the Assembly, Holden had an impressive record of success with 13 of his proposed measures signed into law. These included providing more funds for domestic violence shelters, ensuring tax breaks for military personnel, helping small businesses and creating economic opportunity for pioneering start-up companies. Other bills give our communities more control over regulating massage businesses, provide law enforcement with the tools to fight human trafficking and increase efforts to protect open spaces and parklands for generations to come. He established himself as a leader in strengthening the economic vitality of the San Gabriel Valley by organizing a transportation roundtable with Los Angeles Mayor Eric Garcetti and the mayors of 11 other cities to discuss the transportation priorities for the area, including the future of the Metro Gold Line extension. Assemblymember Holden has a keen interest in building stronger trade relations with foreign countries. At the invitation of California Governor Jerry Brown and the Mexican government, Holden joined a conference on international trade in Mexico City which highlighted the growing economic bonds between Mexico and California. Prior to his election to the Assembly, Chris Holden served 23 years as a Pasadena City Councilmember and Mayor. He was the youngest City Councilmember at age 28 and only the second African American to serve as Mayor. Throughout his years of public service, Chris has been a champion in creating jobs, preserving vital services, strengthening the economic vitality of the San Gabriel Valley and expanding light rail. While on the city council, Chris served as a Commissioner and President of the Burbank-Glendale-Pasadena Airport Authority and on the Pasadena Light Rail Alignment Task Force. Chris owns CHMB Consulting, a real estate firm. He is a lifelong resident of the district and graduate of San Diego State University. He lives in Pasadena with his wife, Melanie, and children Nicholas, Alexander, Austin, Mariah and Noah.